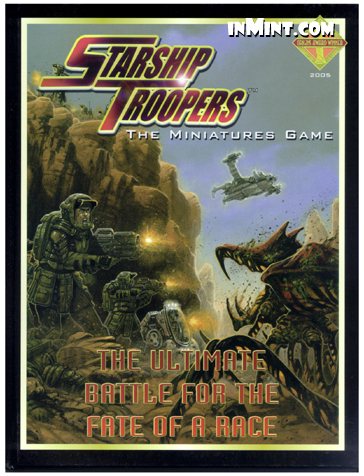 Starship Troopers is a new and exciting miniatures game designed around an innovative new gaming system emphasizing the antagonism of the two major combatants, pitting the advanced civilisation of the United Citizens' Federation against the terrifying brutality of the Arachnid Empire. With Starship Troopers: The Miniatures Game, featuing the Mobile Infantry, Arachnids and their desperate struggle for the supremacy of the galaxy. Based on the Live-Action movies and the Roughnecks: Starship Troopers Chronicles CGI series, this is a game of high-octane excitement, danger and glory on the battlefields of far-off star systems. Take up command of the Mobile Infantry and serve the Federation as they fight their way across the countless hostile and alien worlds of the far future. Or control the full might of the Archnid Empire as it swarms across the galaxy with only one thought in mind - the toal annihilation of humankind.